Are you looking for making lawyer website? If yes we have added a list of best lawyer WordPress theme for you to make professional looking and beautiful website. These themes are specially designed for individual attorneys or a group of companies, all the themes which listed below are highly editable and customizable as per your requirements and really applicable for various purposes such as financial services, law portfolio, recruitment and much more. 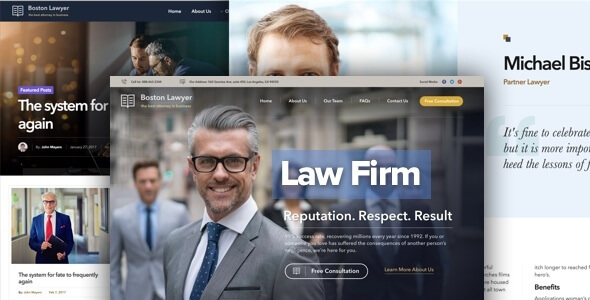 Additionally, when we reaching about the best lawyer WordPress theme we were overcome huge number theme with best features and functionality, some of a lack of features and low performance, but we have gathered the best and recommended WordPress lawyer website theme for your suitable purposes. I must say all these themes have the necessary features to help you build a perfect website to grow your business. 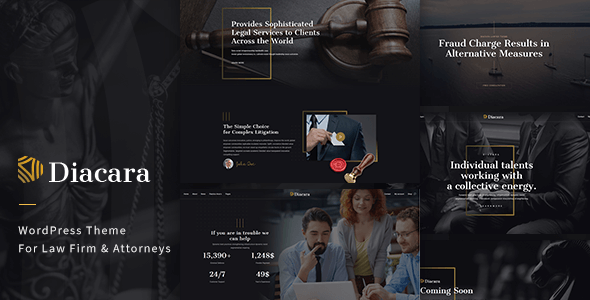 As we know the legal industry become more crucial magic nowadays, for lawyers purpose specifically to keep their trust, compassion, dependability, and professionalism this lawyer’s WordPress theme will be a core result. Also, this list of themes also provides clients to easily find the best representative for their case, make their job easier with its stunning looks. This is responsive WordPress theme advanced features list includes everything to make amazing lawyer and law firm website. It has offered a visual composer page builder to make your homepage and custom page more beautifully and uniquely. With no more time spending with simply using drag and drop features. A unique set of 8 homepages design that you can apply easily even without any modification, quality sample content and pre-made pages that you can use as it is. Support for WooCoomerce plugin to make and manage your online store under minimal requirement and make extra money online. WPML multi language plugin to translate your website unlimited language improves the website usability. Do you need to improve your website to search engine rank, if yes install Yoast plugin to setup your website rank. As well make your homepage more beautiful by adding a slider image with slider revolution plugin. Exclusive admin theme options panel controls your website under simple supervision. Likewise their dozen of features available for the real buyer and make use of all the essential features. Specially built for legal offices, lawyers, legal advisors, attorney, advocates, and other legal related services. This is a responsive theme with the modern and clean design with optimizing content for mobile and tablets devices, all the layouts and contents are accurately displayed and include nice revolution and illustrations. It has come up with opening hours, free consultation forms practice area, Q & A, team member pages and much more. Without any programming knowledge, this let you make the amazing eye-catching website with drag and drop features. 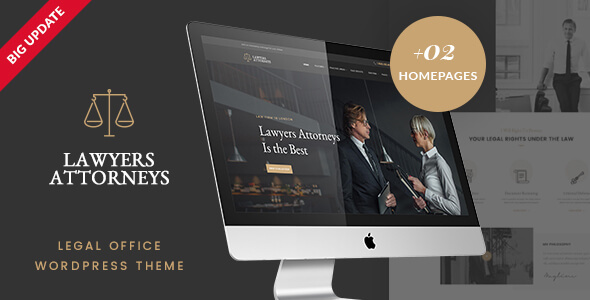 If you select Lawyer & Attorney theme you will have dedicated support, free lifetime updates which will be notified in your theme dashboard, over 25,000 clients around the world. Different types of header and footer layouts to apply to your website and keep change often to keep your audience with. Additionally, you will have feature boxed and full-width layouts that can easily edit and customize as per your requirement. If you think making your website from scratch will time consume, simply import demo content your website under one minute with the single click? 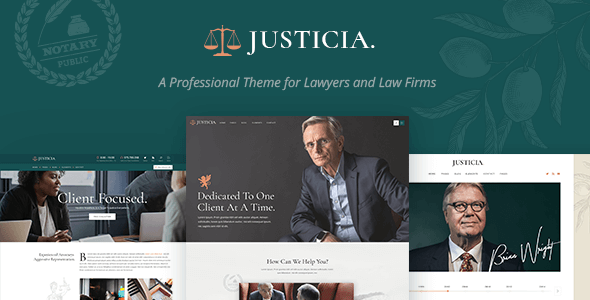 A quality WordPress theme for a lawyer, attorney, and legal business. Clean and modern design with a number of features. Specifically, visual composer page builder to make the stunning web page and add more widget and short-codes to the homepage. As well as this also tested for high-speed page loading to improve website performance, additionally all the CSS files and animations are minified to an external file that will definitely reduce the page loading time. The complete package also included a sticky navigation bar to improve page user-friendly, mega menu header to showcase your latest law-related portfolio and galleries. Parallax effect header and scroll navigation with image background and illustration. SEO ready content and layouts to rank your website in google search result with any additional or third-party plugin. While translate your website multi-language by simply installing WPML plugin. Apart from that demo importer available to make your website under one minute with a single click. Libero is a fully responsive WordPress theme with 6 different homepage design. Which is a great solution for all in one law-related websites? As well as the complete packages including all the necessary features, layouts, and element which all law related website should have. Powerful admin theme option with advanced features to control your website, and customize and edit the just by drag and drop features with minimum requirements. Carefully created elements and typography are giving additional look to libero theme. Parallax design and layouts with image background, as well full screen and boxed parallax design for more usability. Support for WooCommerce plugin to make and manage your shop page to make some additional income. And WPML plugin to translate your website into multi-language. 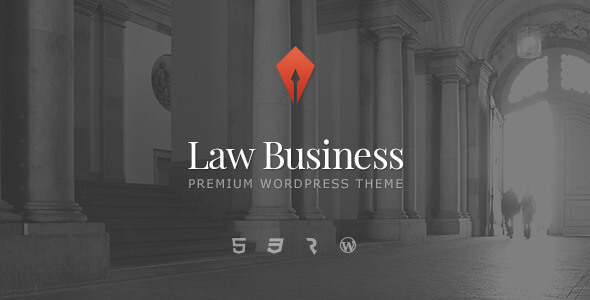 Responsive WordPress theme for legal and attorney website with easy setup built-in features. 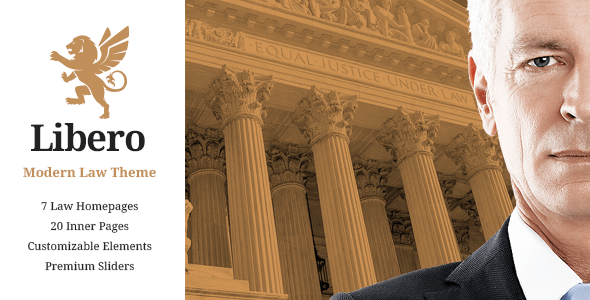 Suitable for the law firm, lawyers, legal business, attorneys and consulting business. The author has spent more time to research to make this massive theme and creatively built all the element, pages and element with optimized content for all the devices. Definitely, this theme will be a suitable solution for those who are looking high end and quality law website. Included most popular plugin itself such as visual composer to make drag and drop page make without any coding knowledge and WooCommerce plugin to start to make online store with law website to make some additional money online. Additionally, included custom widgets and short-codes with Lawyer theme, beautifully categorized all the widgets, icons, and testimonials. Meanwhile added a call to action form to quickly contact a representative. Specially design for a law firm, law advisors, legal officers, barristers, finance and much more. This theme comes up with essential features and functionality that each law websites should have. 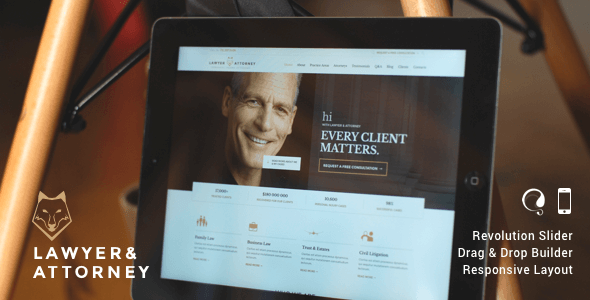 This theme also provides multi columns layouts for attorneys listing, additionally, it has 3 types of layouts formats which you apply one by one and selects suitable layouts for your website. Moreover, this theme also support for important plugins such as WooCommerce to make and manage online shop page and WPML to translate your website to multi-language site. Make your homepage more attractive with a master slider, which one of great plugin for making slider image on your website just with simple drag and drop features. 100% mobile responsive design and layouts with optimized layouts. 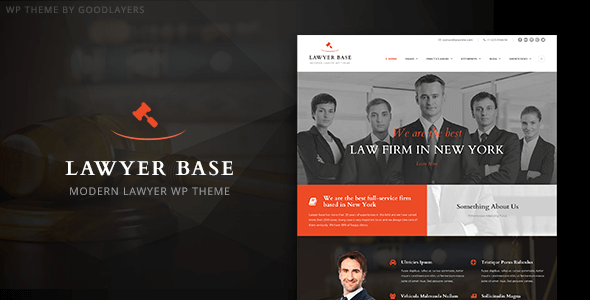 A clean and professional WordPress theme for lawyers, attorneys, advocates, counsels, and other law-related business. Comes with a bundle of features and plugin to improve the usability of the website. Nicely and carefully designed layouts that ever need any additional knowledge to customize. The theme uses more inbuilt features that will instantly grow the website without any further plugins. Support for visual composer page builder to make stunning looking web page under minimal requirement simply drag and drop features, meanwhile, this allows to edit and customize the page easily as per your requirements. SEO optimized content and fully responsive layouts with fast page loading times. 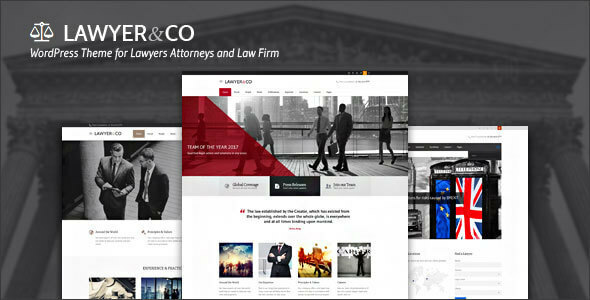 Excellent theme for law and attorney website with essential features and functionalities. The really suitable theme to engage new clients and keep existing clients. Theme offer 6 unique and different demos to check out before actual development starts. Moreover, a quick demo install will make your website more and faster. Well designed and nicely locate header and footer that will look awesome, with the unique color selection. Support for Visual Composer which is a great plugin for drag and drop page maker without additional coding knowledge. 100% fully responsive layouts and design that can access from any kind of devices with optimized content, there set up your online store and make some online money by integrating the WooCommerce plugin to your website. And make your homepage more and more stunning with slider revolution plugin by simply adding slider images to your homepage and custom pages. Ideal solution for private attorney website with necessary functionalities and features. 100% fully responsive theme with unique optimized formats, nicely placed display option, resolution and illustration. The fantastic of this theme is, its offer WPBakery page builder to customize your WordPress theme and create your custom page as per your requirements. A great selection of short-codes and widget available to improve your website engagement. Additionally, all the pages and post are optimized for search engine, and if you want you can rank the website by adding appropriate keyword and query. Custom admin theme options panel to greatly initialize your website functionality within minimal requirements. And check out more features before starting to buy this theme.